Jowo Shakyamuni aka Jowo Rinpoche (Tib. ཇོ་བོ་རིན་པོ་ཆེ་, Wyl. 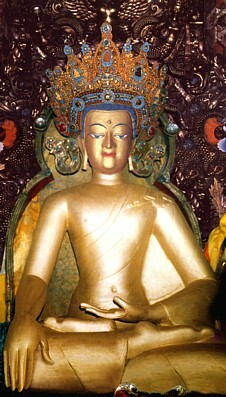 jo bo rin po che) — the most sacred image in Tibet, representing Buddha Shakyamuni, housed in the Jokhang temple in Lhasa. Believed to have been crafted during the Buddha's life by the celestial artist, Vishvakarman with the guidance of the god Indra, the Jowo Shakyamuni statue originally belonged to the king of Magadha who gave it to the king of the Tang empire in China. His daughter, Wencheng Kongjo, brought it to Tibet in her dowry when she married King Songtsen Gampo. This page was last edited on 15 March 2017, at 23:48.